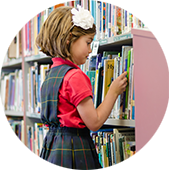 The STM Catholic curriculum follows the curriculum guidelines of the Archdiocese of Denver, and is in compliance with all state education requirements. It is designed to prepare students to succeed in any rigorous high school academic program by providing a firm foundation in fundamental knowledge and skills; encouraging breadth of intellectual exposure and depth of study; and inspiring creativity and critical analysis. Solid as it is, our curriculum is in a continuous state of evolution as we aim to equip each new incoming class with the tools, confidence, and abilities demanded by our increasingly complex world. provide the backbone of our academic programs. The emphasis on essential knowledge in our core curriculum is time-tested and well-proven to best prepare students for the road ahead, regardless of the academic path they may choose. Second Step Program is a social-emotional learning program, taught by our school counselor, that introduces a set of essential skills that deals with bullying and other socially challenging scenarios. It also allows parents to become actively involved in the learning process and opens up the lines of communications.